"Effects of the Gunpowder Explosion at Bryn-Mawr"
Click here or on the engraving below for a larger version. "..who had gone with a lighted candle to fetch some powder for a customer in the shop, was blown to pieces; and one or two persons in the street were struck by falling stones of the house, and killed at once, or so injured as to cause their death. 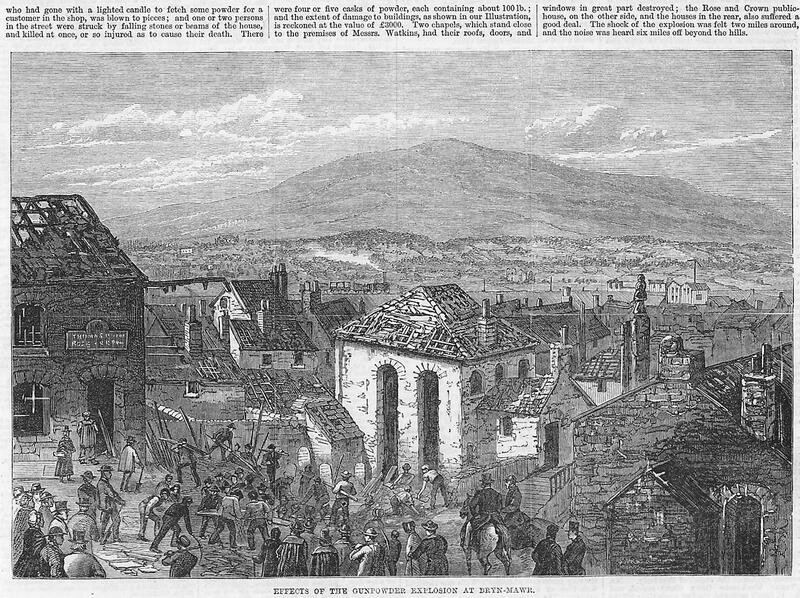 There were four or five casks of powder, each containing about 100 lb., and the extent of damage to buildings, as shown in the illustration is reckoned a the value of £3000. Two chapels which stand close to the premises of Messrs. Watkins, had their roofs, doors, and windows in great destroyed; the Rose and Crown public house, on the other side of the houses in the rear, also suffered a good deal. The shock of the explosion was felt two miles around, and the noise was hears six miles off beyond the hills"
In addition to appearing in the Illustrated London News, the story was also mentioned in two brief articles from the London Times, dated January 17 and January 29, 1870. It appears that there was some initial confusion as to the identity of the boy killed in the explosion. The Times article of the 17th identifies him as Evan Evans, while the article of the 29th calls him Evan Havard. In the book, "Old Brynmawr, Nantyglo & Blaina in Photographs," by Trevor Rowson and Edwin Jones, he is identified as Evan Herbert. In both Times articles, the girl who was killed by the explosion is identified as Catherine Leek. The Times article of the 17th concerns itself with a description of the explosion, while the article of the 29th reports on the official inquest into the accident. Additional details from the former article tell us that the explosion involved "three of four casks, each of which contained about 100lb of powder," and that the boy Evan "was blown to pieces, and some parts of his body were subsequently found on the housetops at a considerable distance from the scene of the explosion." The article says that Catherine Leek, who was playing nearby, was about three years old, and was "struck by a stone and killed on the spot." The explosion apparently injured (at least) five other individuals who were "injured by the concussion and falling of stone and pieces of timber." Damage to buildings nearby was reported as including broken windows, blown down walls, and roofs that were "carried away in all parts of the town." In the article of the 29th, the report of the official inquest, the jury found that there was actually no proof to say how the explosion occurred, however it did find that "the law at present is regard to the keeping of powder in populous places is lax and insufficient, and requires amendment." The jury also chided the powder dealers of Brynmawr by saying, "that quantities (of powder) are habitually kept by dealers greatly in excess of the amount allowed by Act of Parliament." The jury went on to recommend that powder dealers in Brynmawr become licensed and be subject to the supervision of the police, saying that "the establishment of powder magazines in populous places in the mining districts is urgently required." 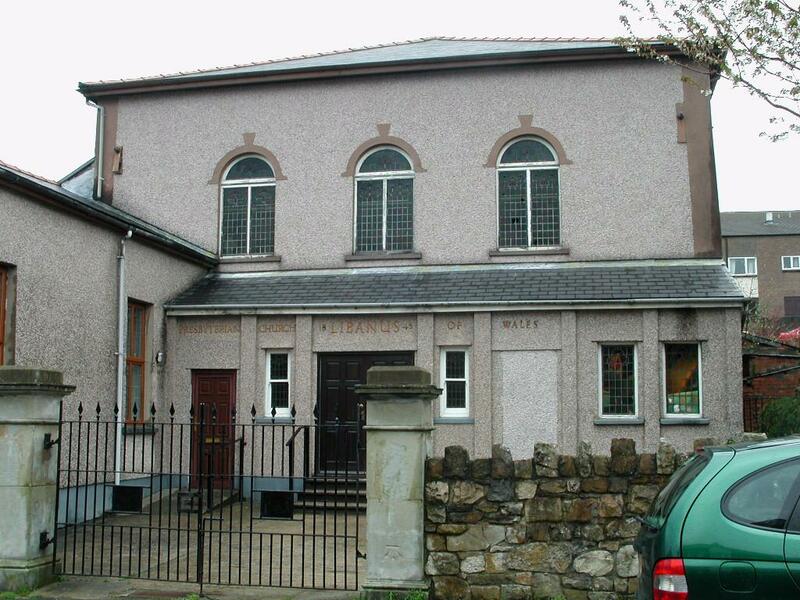 Libanus Chapel Church, located at the top of Chapel Street, was founded in 1848 and was damaged by the infamous Brynmawr gunpowder explosion of 1870. 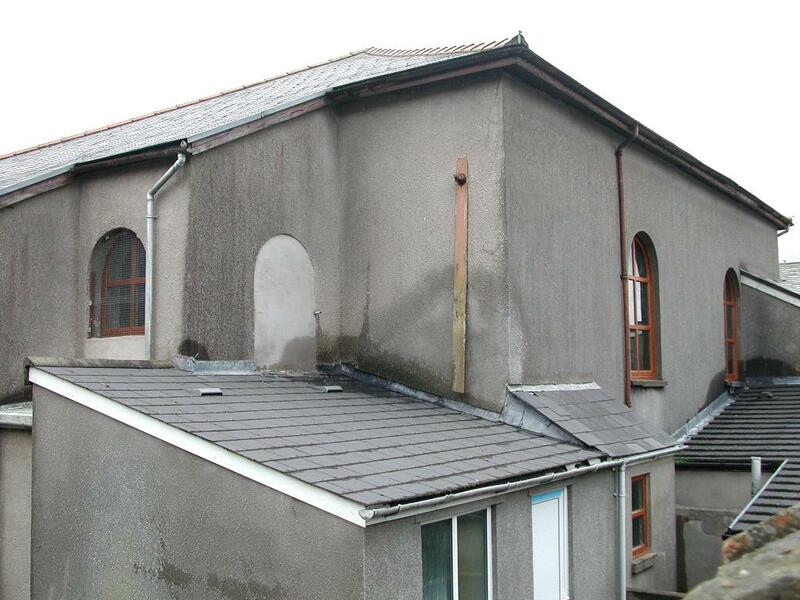 The chapel and other buildings nearby were so badly damaged by the explosion that they had to be reinforced with iron pins, one of which is still visible in the 2nd photograph below. This web site is copyrighted © 2004 by Jeffrey L. Thomas, with all rights reserved.